Designing image-based lighting with Illumination Brushes. The bunny model has a measured white glossy BRDF. 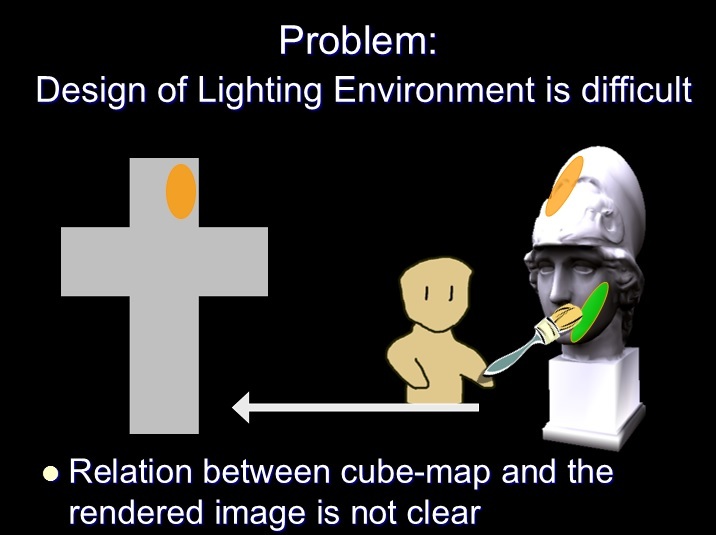 (a) The user paints the desired diffuse appearance directly on the 3D model. Pink and orange diffuse brushes are shown. (b) The scene is rendered using the estimated environment map. 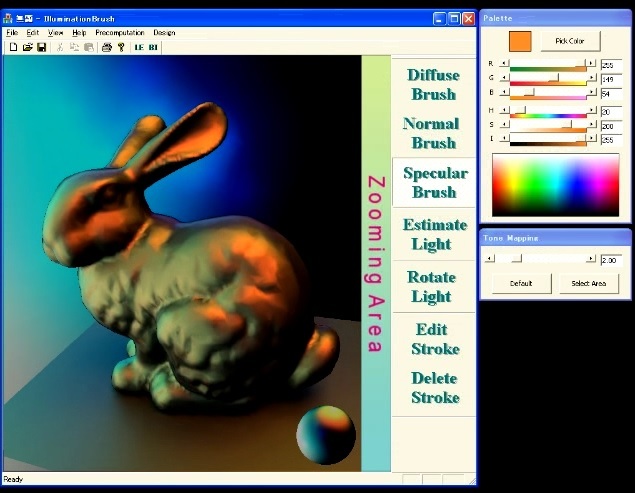 The user paints a blue highlight on the bunny with specular brush. (c) All of the painted lighting effects are satisfied by rendering the bunny using the designed imagebased lighting environment shown in (d). We present an appearance-based user interface for artists to efficiently design customized image-based lighting environments. Our approach avoids typical iterations of parameter editing, rendering, and confirmation by providing a set of intuitive user interfaces for directly specifying the desired appearance of the model in the scene. Then the system automatically creates the lighting environment by solving the inverse shading problem. To obtain a realistic image, all-frequency lighting is used with a spherical radial basis function (SRBF) representation. Rendering is performed using precomputed radiance transfer (PRT) to achieve a responsive speed. User experiments demonstrated the effectiveness of the proposed system compared to a previous approach. 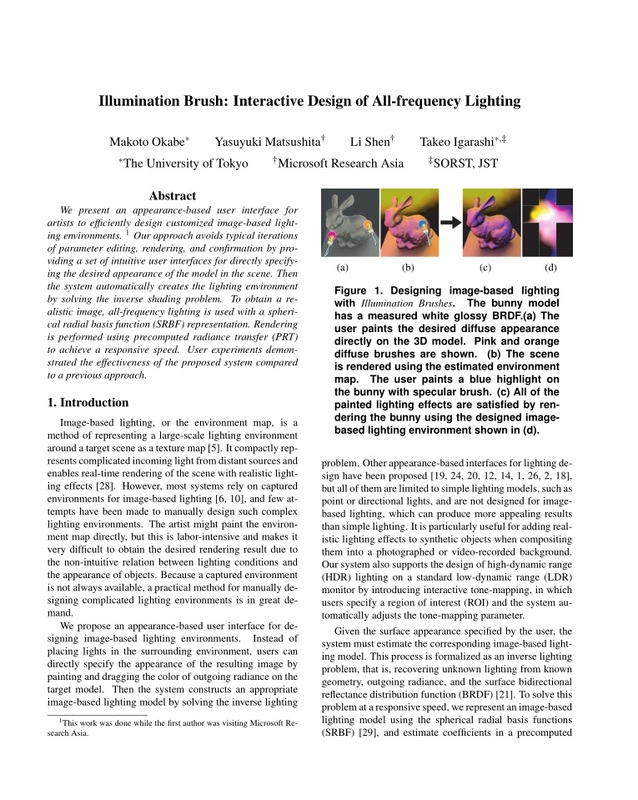 Makoto Okabe, Yasuyuki Matsushita, Li Shen, Takeo Igarashi, "Illumination Brush: Interactive Design of All-frequency Lighting", in Proc. of Pacific Graphics 2007, pp. 171-180.